The SQL Database Backup and Restore is effortlessly done with the help of SqlBak Tool. The SqlBak.com is a secure SQL Backup Service Agent that monitors the SQL Database of your website in a perfect manner. SqlBak is the tool that creates the backup and restores of your website’s SQL Database along with the copying to the External Cloud Backup (Dropbox, FTP, Google Drive, Onedrive, etc.). The automatic schedule backup and remote access of the complete SQL Database is possible with SQLBAK. The SQL Server Monitoring and their status would be emailed to the users regularly. Why do you need SqlBak? The SqlBak offers better SQL server backup to the customers and also monitors the real-time SQL server on the go. The below reasons would help you choose SQLBAK due to its wide functionality. It helps you secure your valuable SQL Data and Restore them safely. You could be able to access & control the SQL Database remotely anywhere. It helps you get a copy of your SQL data for the External Cloud Storage automatically after integration. Monitors the SQL server health and Email their status frequently to your inbox without any flaws. It helps the users maintain Multiple SQL servers at the single place perfectly. Restore Point saves your hard precious data and reinstates the website faster. I recommend you choose SQLBAK as it handles all the SQL server backup and restores activity via automation process. It keeps your data secure and safe. The SQLBAK boasts with many amazing and vital features for your SQL server module. It comes with multiple unique features, and they are the essential things as like the most of the people love to secure their precious data online. The SQLBAK sends all the activities that carried out on your SQL Server with the proper report to your mailbox. It helps you keep an eye on your website’s SQL Database health. The performance of your website is also recorded periodically and sent to the users’ inbox in time. It makes the users stay alert and safe every time. Do you ever face any hard situation with your SQL Database? The most difficult situation is when your website goes down and starts malfunctioning. Now, you could effortlessly secure and restore your valuable SQL database with SqlBak.com. The SQLBAK collects and makes a mirror of your SQL Database without any complex process. It helps your backup data compiled in the single place which might be useful for restoring your SQL Database in time. The SqlBak is capable of performing its duty when it gets installed on the SQL Server for the single time. It doesn’t force the user to login each time to access and monitor the SQL Section. The one-time installation of the lightweight software on your remote machine makes the work easier than before. You’ll be able to manage every action in the single place without any repeated login procedure. The complete activities that the SQLBAK carried out would be really safe. It has the SSL – Secured Sockets Layer communication which makes every move authentic & valid. Their user-friendly wizard and dialogue box would never make your work a complex one. 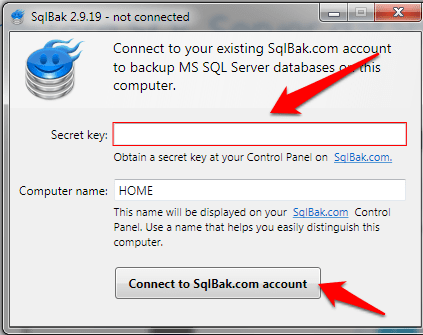 How to Backup & Restore SQL Database with SqlBak? The below process would demonstrate the exact process of SQL Backup and Restore using SQLBAK Service. You need to click the Download Menu from SqlBak.com to download the software. Now, Setup and Install the SqlBak Software (lightweight app) on your Desktop/Laptop. It would ask you feed the Secret Key. Now, you should Sign up for SqlBak. After the successful account creation, you’ll receive the Secret Key from your Dashboard. Enter the key on the installed software. And then enter the SQL server details to connect to your server. Finally, you’ve successfully installed the software for your remote access. Now, configure your website with SQLBAK integration. Click Add a new backup job from your dashboard to make the backup of your SQL server and click continue to job settings to finalize the settings. You’ll be able to configure the Schedule Backup feature and setup the Email Notification settings further to automate the process. Finally, you’ve finished viewing the SqlBak review and the mini tutorial of SqlBak via this blog post. The SQL server backup should be made mandatory in these days to avoid the risk of losing the website’s precious database. You should be aware of managing and monitoring the SQL Server database for scaling your growth as well.